I am a dishwasher for a living, so this review will address their usefulness in a fast-paced, high-volume restaurant setting. - VERY tough. I have handled broken glass, dunked them in near-boiling water, touched pans that just came out of the oven, etc. and they have managed to last over a month so far. They are just now starting to crack a bit, but considering that they're being used for hours on end and dealing with restaurant-level dishes and cleaners, I'd say they'll last quite a while for around-the-house use. - Cotton liner makes putting on/taking off very easy. - Easily washed - just turn them inside out and run them through your washing machine and they're good as new. - Made from vinyl and not latex, so those with allergies shouldn't have any issues. - If using them for long periods of time, your hands will start to sweat. Not only will this make the gloves smell bad, but if used long enough, the smell can stick to your hands for days, no matter how much you wash them. Make sure to let them air out or wash them after using them. -Even though they have textured hands to allow for greater grip, they are still sort of slippery when wet. 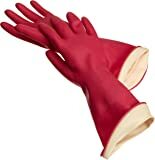 As household dishwashing gloves, I would highly recommend them. For restaurant-level dishwashers, though, they might not last you as long as you think. Still, they are very useful, and I would definitely recommend trying them out to see if they fit your needs. True Blues gloves are almost perfect. There’s a durability/leaking problem which I’ll explain how to solve. When washing dishes, it’s often necessary to use fingertip pressure. This can result in small cuts inside the fingers of the gloves causing leaks, especially when hot water has softened the rubber. 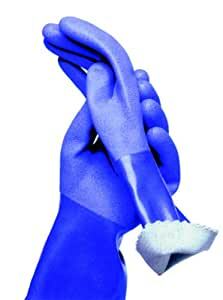 After experiencing leaks with every new pair of True Blues gloves after just a month or two of use... I finally figured out I wasn’t mishandling knives or other sharp objects, it was my fingernails digging into them, even though they are trimmed short. 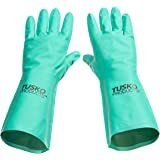 First, put on some thin “Epica cut resistant gloves” (which can also be purchased on amazon for around $10) and second, put on True Blues rubber gloves over the top to form a protective barrier between fingernails and rubber gloves. I’ve been using the same pair for over 6 months now with no issues using this method. In my opinion this is the perfect combination which also serves as “socks” for reviewers complaining of smelly gloves (which I have never experienced). Seriously though, how much breathability do some people expect from waterproof rubber? :) I receive nothing for promoting either of these products except knowing I possibly helped others with the best dishwashing gear. 5.0 out of 5 starsFinally. I am kind of obsessed with kitchen gloves. I don't clean the house or do dished without them. But typically they get holes or cuts and need to be replaced constantly, which is annoying. So I am so happy to have discovered these gloves. They are thick, and protect my hands from scalding water, and also are very resilient. I have had these for months and they are still waterproof. I will never go back to Playtex or any other gloves. These are by far the best, lifesavers. Totally worth the investment, you will save money in the long run. 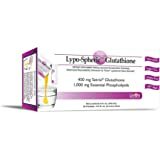 Excellent product, highly recommended. 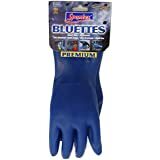 5.0 out of 5 starsMy favorite dish gloves! I own these in red and blue and I love them because they are so thick that you can have your hands in the hottest water and not feel a thing. They grip dishes well and are extremely well-made. I imagine they will last for a long time. My only comment is to be very careful not to get water on the inside. If you do, make sure that you put something inside to hold them open while they dry. Otherwise they can get kind of a funky smell in them. It happened to me on a single glove and I had to turn the glove inside out and wash it very well with soapy water and then dry it for several days on a stand that forced it open for airflow while it dried. I'm careful now so that doesn't happen anymore. Overall I am extremely pleased with these gloves and will likely never buy another type. These would be perfect if they were a tad bit longer. They're thick enough to insulate, but not so stiff I can't get things done. I love the color; I ordered the green based on other reviews that suggested they more flexible, but it's the color I preferred over the other options. My only real issue with them is the length - our sink is pretty standard, but if it's close to full, I have to use a tool to pull the stopper out - otherwise, water seeps over the top of the gloves (grrrr). I"ll probably get them locally going forward, to save a bit, but it was nice to have them delivered and try them out without driving a couple towns over. Now I can just grab a spare the next time I'm at World Market. These are far superior to the fancier ones I bought before this. Those were longer (had a long cuff in a decorative pattern) but too thin.